The list of capital cities of USA include important historical, political, and financial centres across the country. Today, 50 states make up the country. The mainland, located between Canada and Mexico, is made up of 48 connected states. This area is referred to as the contiguous United States. 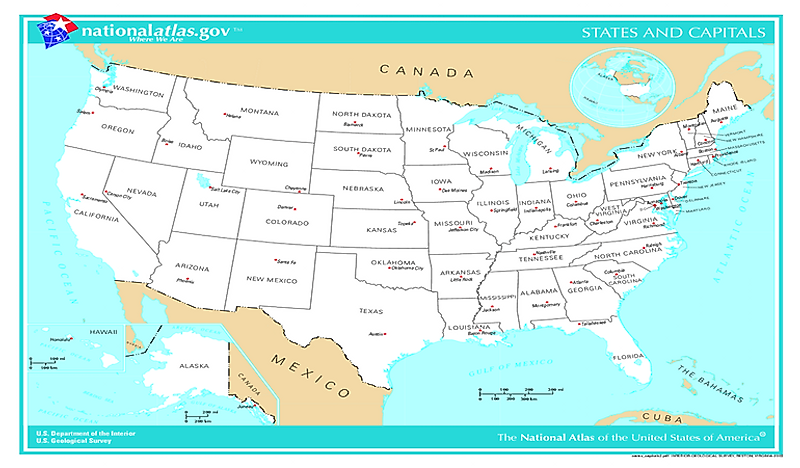 Non-contiguous states include Hawaii, an island in the Pacific Ocean, and Alaska, a large area connected to the western coast of Canada. East state has one city that serves as its political capital. Choosing the capital cities of USA have followed little uniform reasoning, some are the most-populated cities in the state, and others are centrally located. In other cases, the seats of state government are neither economically important nor conveniently located. So how did lawmakers decide which cities would become the state capital? The answer: it depends, each state has a unique history. Voters often lobbied their politicians to have their home cities distinguished as capital. The belief behind this was that capital status would stimulate economic growth or encourage settlement. History has shown that this theory is not always the case. Other capital cities of USA were chosen while the country was still worried about attacks from the British. They chose cities that were geographically protected should war break out. Dover, established in 1777, of Delaware is a perfect example of this. Politicians chose Dover over New Castle, an important port city that could be easily attacked by approaching ships. Other capitals, like Trenton in New Jersey and Tallahassee in Florida, were chosen because they were the sites of the first settlements within the state. These capitals already had a substantial population and had already played an important role in the history of the country. Many capitals that today seem strangely placed or sparsely populated were once very important cities for trade and industry. Given that so many capitals do not hold the most powerful state economies, what are their roles today? Today, the capital cities of USA are important as the center of state government. The legislation is written, argued, voted on, and made into law in capital cities. Some of the most populated state capitals include Phoenix, Arizona; Indianapolis, Indiana; Austin, Texas; Columbus, Ohio; and Boston, Massachusetts. Phoenix, first called Pumpkinville, was first settled as an agricultural center in 1867 and was established as a city in 1881. The economy grew significantly after the railroad construction during the same decade. The population grew, the municipal government organized itself, and the state capital moved from Prescott to Phoenix in 1889. Today, it is the most populated state capital in the country and hosts universities, hospitals, banks, and a major airport. Indianapolis, the second most populated city, has always played an important role in Indiana’s development. Established as the capital in 1825, the city was originally founded in 1816 and modeled after Washington, DC, the national capital. Once again, the railroad of the 1850’s helped this economy to grow and thrive. Its railroad access also made it a critical player during the Civil War when it joined forces with the North. This city also established a banking industry early in its development. Today, it continues to be the economic and culture center of the state. The least populated capital cities of USA include Montpelier, Vermont; Pierre, South Dakota; Augusta, Maine; Frankfort, Kentucky; and Helena, Montana. Montpelier, Vermont has a current population of approximately 7,705 making it the least populated state capital. This was the first settlement in Vermont and was named in honor of a French city to recognize the French for their support during the American Revolution. Today, this city is both the state capital and the county seat. People commute here daily for their jobs and on a regular Monday afternoon, as many as 21,000 people could be inside the city limits. Aside from public administrative functions, higher education also plays an important role in the economy and the city hosts 3 colleges and 1 university. For a look at all of the US state capitals and their year of establishment, a list is published below.